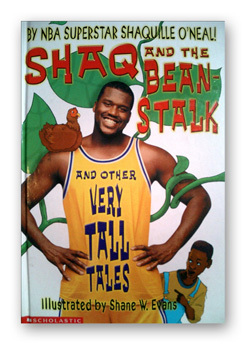 Shaq and the Beanstalk, by Shaquille O’Neal, Scholastic Books. Ages 4-8. This is one of Evans’s first books, and one he holds dearest to his heart. The book combines paintings, full-color photographs and lots of white space to create a thoroughly unique and imaginative look. Children will enjoy the visual surprises and clever spin on this familiar fairy tale by a real-life, 7’1’’ giant. Guaranteed to score high points! “Shaq and I had a great time working on this book!” reports Evans. Get in on the fun!